Created and Maintained by Bruce Gomes Sr. 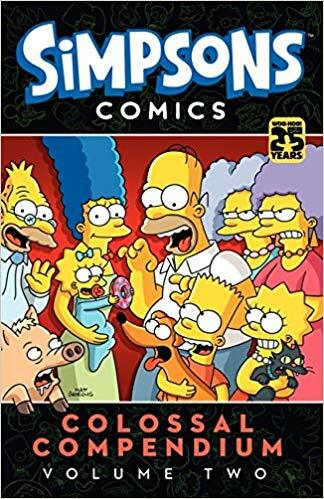 Following below is a list of books that contain a collection of reprints of previously issued Simpsons Comic books in the United States. Some of these volumes also contain bonus material. The precise content of each volume below is detailed in our Comic Reprint - Detailed Contents document. If you know of any material that should be listed, but isn't, please contact me!. 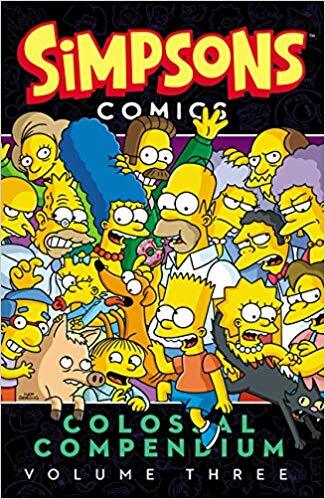 For information about the comics themselves, see The Simpsons Comics Guide. See Notes at end of this document for additional information about reprints! Calendars: US UK Germany Spain Italy France Finland Aus. 288 pp., 10.0" by 6.8"
Radioactive Man selections from Simpsons Comics #36, #37, #38 and #39. For precise detailed contents see the Detailed Contents page. 128 pp., 10.9" by 8.1"
Reprints: Combines new material with selections from Treehouse of Horror Comics 12 and 13 For precise detailed contents see the Detailed Contents page. 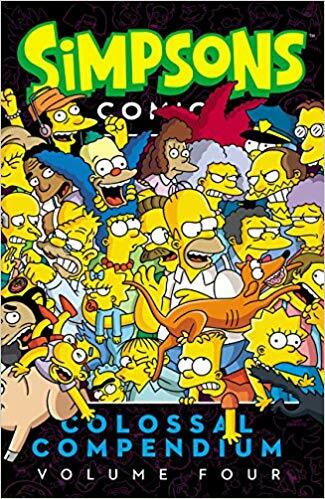 208 pp., 11.6" by 7.9"
The Simpsons Futurama Crossover Crisis II #1, #2, selections from Simpsons Comics #87 and The Simpsons Summer Shingdig #2, an additional 42 pages of new material and a separate reprint of Simpsons Comics #1 inserted in a sleeve inside the back cover. 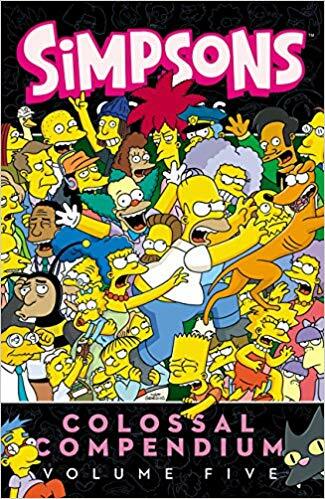 Not your standard reprint, but a deluxe hardcover slipcase edition that also includes 25 additional pages of thumbnail layouts, rough pencils and character designs and an additional 17 page Simpsons Futurama Masterpiece Gallery of original art by our favorite Simpson artists! Nominated for a 2011 Eisner Award for Best Graphic Album-Reprint. To Be Released July 2013! 128 pp., 10.0" by 6.8"
Summer Shindig #8 (Poolin' Around; What the Hole?! First Edition: Bongo Entertainment, Inc.
128 pp., 10.2" by 6.7"
Softcover, Bongo Comics, 128 pp. Library Binding, March 2008, Turtleback Books, San Val Inc.
120 pp., 10.2" by 6.7"
This book had a wraparound cover, a nice view of which can be also been seen on the Detailed Contents page here! 117 pp., 10.2" by 6.7"
160 pp., 10.2" by 6.7"
For a view of the wonderful wraparound cover and the precise detailed credits and contents see the Detailed Contents page. 176 pp., 10.2" by 6.7"
For a view of the wraparound cover and the precise detailed credits and contents see the Detailed Contents page. 128 pages, 10.0" by 6.8"
144 pp., 10.0" by 6.8"
Reprints: Simpsons Comics 85, 86, 88, 89, 90 and additional new material! Effective with this reprint the comic covers were no longer reprinted but several single pages of new material was supplied in its place. See the Detailed Contents page! 120 pages, 10.0" by 6.8"
144 pp., 10.9" by 8.1"
144 pp., 10.8" by 8.1"
128 pp., 10.9" by 8.0"
144 pp., 10.9" x 8"
Combines new material with selected items from Simpsons Comics 15, 52, 79, and the Itchy & Scratchy Holiday Hi-Jinx issue. The Simpsons Winter Winter Wingding 1, 2 and 3. As magazines they don't necessarily belong in this list, but nonetheless, it's the best place to include them since they are comic reprints! All published in two virtually identical editions, marked above the UPC as the "Direct Edition" or an unmarked edition (formerly "Simpsons Comics Presents" edition) for distribution in comic book stores and book stores respectively, differing only by the UPC and bar codes. "Mmmm... Collectible!" "Fantastic First Issue! 4 Big Stories!" 64 pp., 10.85" by 8.3"
"The World's Funniest Comics!" "4 Fun-Filled Stories!" Reprints: Simpsons Comics #5, Bartman #3 and Itchy & Scratchy #3. Brings together the "When Bongos Collide!" story that spanned three comics. Begins on page 23 of Itchy and Scratchy 3 then adds a few panels to smooth the transition into Simpsons Comics 5 and then Bartman 3. "The Greatest Comic on Earth!" "4 Great Stories!" "Who Knows What Evil Lurks Inside Mr. Burns? Bart Knows!" "4 Big Stories!" "Welcome to the Island of Mr. Burns!" "Comics Over The Edge!" "Big Stories! Big Fun! Big Deal!" "Plus: Vintage Itchy & Scratchy!" "I Want My Simp-TV!" "TV Goes Topsy-Turvy!" "4 Big Stories!" "4 Fantastic Stories" "The Mystery of Jebediah Revealed!" "Fun for the Nuclear Family!" "Welcome to the Montgomer-E-Mart! ";"4 Big Stories!" "Sideshow Bob is Back!" "4 Big Stories!" Documents title of first story in Simpsons Comics #28 as "The Clown who Would be King", which is not documented in the original comic or in the Big Bonanza reprint book above. "Everything's Coming Up Milhouse!" "4 Big Stories!" "Babies On Board!" "4 Big Stories!" Canadian price removed from cover. "Won't You Take Me To... Chunkytown!" "Now in HD! (Homer Definition)"
"4 Big Stories!" "Frenemy Mine!" "We're Just Toying With You!" "4 Big Stories!" All published in two virtually identical editions, the "Bongo Comics Presents" edition and the "Direct Edition", for distribution in book stores and comic book stores respectively, differing only by the UPC and bar codes. Did not see this however for the first two issues, as noted. "Fabulous First Issue! Free Mini-Poster Inside!" 64 pp., 8.0" by 5.5"
This cover (and the "free mini-poster inside") was in homage to Carl Barks. See cover analyses for Simpsons Comics #102 for more details! "Second Sensational Issue! Hail to the... Cat?" Bart Simpson #20: Bart's Fun Pages! "A Bumper Crop of Comics!" Simpsons Comics #60: My Sister, My Sidekick! Bart Simpson #6: The Invisible Nerd! Simpsons Comics #19: Don't Cry For Me, Jebediah! Simpsons Super Spectacular #1: The Crimespree on Springfield 2! Bart Simpson #3: Terror on Trioculon! Cover taken from cover of Bart Simpson #12. This series ended after four issues. 120 pp., 10 9/16" by 7"
This book was only handed out to employees of Bongo, and consisted of the four issues listed above bound into a hardcopy book. Only 1000 hand-numbered copies were distributed. For additional information see the corresponding entry in the Comics Guide here! Of course, since they simply bound the original printing of the comics into a hardcover book, this is technically not a reprint volume. Spine is labelled "#1" although as of 2010 there were no subsequent printings. The name was reused, of course, with the printing of Simpsons Comics Spectacular in 1995. About 75 pp., 10 9/16" by 7"
This book was only available at Comic Con 2009 and consisted of the three-part crossover series noted above bound into a trade paperback. Only 1000 copies were distributed. The ISBN was printed on the bottom of the back cover. The Simpsons Best Superhero Stories Ever! 64 pp., 10 9/16" by 7"
This book was only available at Comic Con 2011 and consisted of selected stories from the six comics noted above. Only 1000 copies were distributed. The ISBN/UPC was printed on the top of the back cover. 144 pp., 12.2" x 9.4"
We pre-ordered it in early 2004, with Amazon listing the release as June 2004, but in January 2005 they cancelled the order and removed it from their listings. We hope it's released someday! All of the comic reprints are currently in-print. For information about the comics themselves, see The Simpsons Comics Guide. Unlike Germany the US (and UK and Australian) reprints don't include volume numbers. As a result of various special reprints, the assignment of volume numbers is somewhat subjective, but we've nonetheless have sequenced all the standard reprint series. We list the name of each imprint and publisher as of the books first printing (because the names of the imprint changes, not the publisher itself... although that changes too!). In the United States comics are reprinted in book form in softcover by HarperCollins Publishers for book stores (traditional and on-line) and by Bongo for comic book stores (for CBG!). The special Simpsons Futurama reprint volume was printed by Abrams ComicArts. 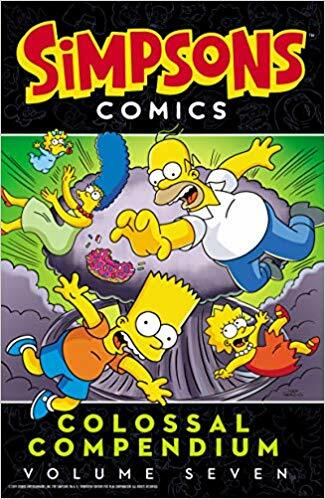 Note that Simpsons Comics are themselves also printed independently in english in the UK and Australia and both those countries also publish reprint volumes under different publishders (Titan in the UK, Trielle Komix and then Otter Press in Australia). 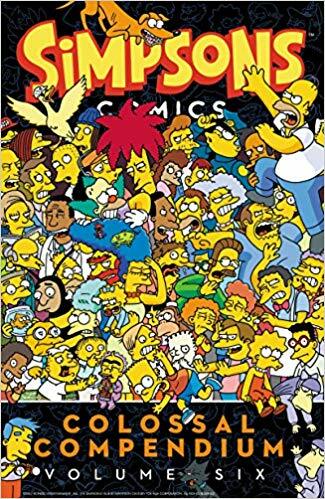 So a volume like "Simpsons Comics Spectacular" has been published in English under nine different ISBN numbers, including the Library Bindings noted below. Turtleback Books was reintroduced as a division of San Val, Inc. in 2009. Starting with a Summer 2004 issue Bongo also began reprinting the comics in a larger magazine format, also listed within this document after the book reprints, similar to what had been done in the UK for many years.